RockUnitedReviews: JOE LYNN TURNER: "Street Of Dreams - Boston 1985"
Joe Lynn Turner: Street Of Dreams - Boston 1985. Originally the live radio broadcast and recording at the Paradise Club in Boston, MA on December 30th 1985, Turner had just released his first and best solo album, Rescue You, and there's not a bum note in sight. What a great way to finish the year off right (still alive in '85) and we all wish we could have been old enough to have been there. Let's face it. Turner has completely turned his music life around and perhaps upside down since writing these songs and is now just another former Rainbow and Deep Purple 'classic rock singer' so I don't think he will write and/or record anything as catchy and fun as 'Rescue You'. Sunstorm, you ask? Close but no cigar and he's not really the writer. I may run out of hype as I type here, because each track is genuinely a different version of JLT at his peak and its own vocal best. The whole band at the top of their game, the same line-up that recorded the album, and guitarist Bobby Messano bring out the best of the pure AOR with smashing hard rocking lead and rhythm work. Add to this original Foreigner keyboardist Alan Greenwood (dut-dut keys all over the place), bassist Barry Dunaway (how are you? ), and drummer Chuck Burgi (Rainbow, Hall & Oates, Billy Joel), and you're in for a treat. The audio quality of the recording is prety darn fine if not good indeed. Radio broadcasts tend to be your provider of fine quality. The set is comprised largely of the 'Rescue You' material (8 tracks), a couple of Rainbow's (Stone Cold, Street Of Dreams), the Buddy Miles cover (Them Changes) and a couple of lost tracks (I Found Love, Good Girls Gone Bad) the latter which Messano later recorded for his solo album. The combination of the quality musicianship and the evident top-notch work in the songwriting department bodes for a rocking good time. 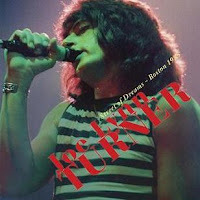 The only official live release of the era, it is one which Turner supports and vividly recalls still to these days. Melodic rock of this calibre deserve all the praise they can get. JLT, I believe it's time to bring back the following songs into your live set: 'Losing You', 'Young Heart', 'Endlessly', 'Rescue You', 'Get Tough'.